Kathy Doering admired the Victorian-inspired Christmas tree at Washington Place during last year's Holiday Open House. 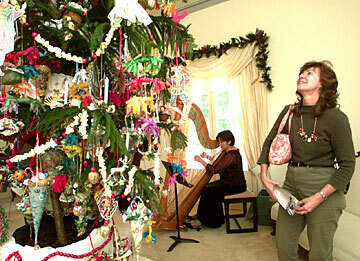 The Holiday Open House at Washington Place takes place from 5 to 8 p.m. Friday, showcasing trees decorated in Victorian fashion, with Christmas music and caroling by the studio artists of Hawaii Opera Theatre. Admission is free. Lt. Gov. Duke Aiona and his wife, Vivian, will greet guests. The tradition of opening Washington Place for the holidays was begun in 1858 by Mary Dominis, who invited 100 children to see the first decorated tree in her home. The Washington Place Foundation will be selling its annual Christmas ornament to support the programs and preservation of Washington Place. The ornament is available at Macy's Oahu stores, Neiman Marcus and C.S. Wo for $20.